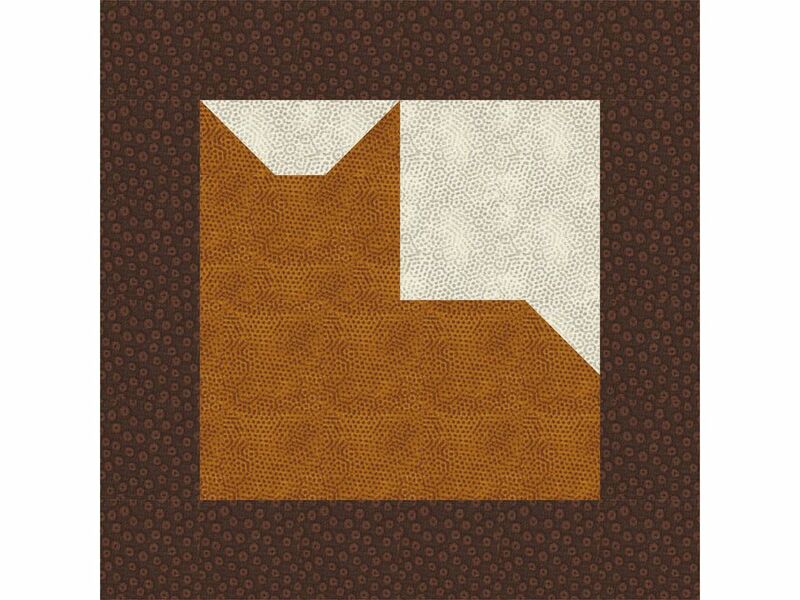 This easy cat quilt block pattern displays the silhouette of a kitty within a frame. You can stitch multiple cat blocks to assemble an entire quilt, making all of your cats identical or giving each a unique personality. It's a fun project that works up rather quickly, even for beginners, and is perfect for any cat lover. The finished cat quilt block in this pattern comes out to a measurement of 12 inches square. If you have some quilting experience, you can easily change the size of the block and may want to paper piece the blocks if they are tiny. Sew the cats in small-print cat fabrics or tone-on-tone fabrics. Add variety by using at least a couple of different frame fabrics. Add beads or lace to create a collar at the cat's neck. Dress the cat up for a Christmas quilt by putting a bow or bells around its neck. Embroider or applique eyes and whiskers on your cat. To begin, cut the following fabric pieces to create one cat quilt block. Quarter yard cuts will work just fine for your cat bodies as long as they are at least 8 1/2-inches long after prewashing the fabrics. Scraps of fabric, fat quarters, and fat eighths are other options. Draw a line from one corner to the opposite corner on the reverse side of each of your 2-inch body and background squares. Align a 2- by 2-inch body square with the end of the 2- by 4 1/2-inch background bar as shown, right sides together. Sew a seam on the marked diagonal line. Repeat on the opposite end of the background bar. Trim off the excess fabric that extends between the seam and outer corner of each square, leaving about 1/4 inch past the seam. Press to set the seam. Flip the body triangle right-side up and press carefully. Repeat on the opposite side. Use the same method to sew a 2- by 2-inch background square to the 4 1/2- by 8 1/2-inch rectangle, taking care to position the square as shown in the illustration. Trim, set the seam, flip triangle up, and press. Use a 1/4-inch seam allowance to assemble the cat quilt block, placing units right sides together for sewing and matching raw edges carefully. Use straight pins to hold fabrics together if it helps you keep the patches aligned. Refer to the illustration as you assemble the cat quilt block. The frames shown are sewn with the same fabric used for the background behind the cat, so yours may differ, depending on the fabric you choose to frame the cat with. Make the cat's head by sewing the cat ears unit to the longest edge of the 3- by 4 1/2-inch face unit. Press the seam allowance towards the face. Sew the 4 1/2- by 4 1/2-inch background square to the right side of the cat's head. Press the seam allowance towards the background. Sew a 2 1/2- by 8 1/2-inch bar to each side of the unit you made in step 2. Press the seam allowances towards the background bars. Sew a 2 1/2- by 12 1/2-inch background bar to the top and bottom of your cat quilt block. Press the seam allowances towards the background bars. Your cat quilt block is finished and should measure 12 1/2 by 12 1/2 inches, including the 1/4-inch seam allowance used to assemble a full quilt. If your quilt block is smaller than it should be, or skewed, press again and recheck it. If it still isn't quite right, use a squaring-up method before sewing it to other blocks. Make additional cat quilt blocks, and sew them together side by side into rows to complete your quilt. If you like, add plain or pieced sashing strips between the quilt blocks. It's easy to make mirror image cat quilt blocks. Simply sew the 4 1/2- by 4 1/2-inch background square to the opposite side of the head unit, and the 2- by 2-inch background square to the opposite side of the cat's body.